HERALD NEWS … ITALIAN FILM FESTIVAL IN BUDAPEST – NOVEMBER, 5-14. 2013. The Italian Cultural Institute, the Istituto Luce Cinecittà and the Puskin Cinema in partnership by now will be holding the XI. th Film Festival in Budapest. Once again the festival shows the actors, directors and new talents where the contemporary Italian filmmaking stands by showing example panoramic view of to-day’s film industrial. The MittelCinemaFest obviously contributes to a clear increase in the number of Italian films marketed in Hungary. In the year 2013. fourteen Italian films were screened in Hungary and many of those which have also featured within festival programs in recent years. The opening pictures at the MittelCinemaFest 2013 will be: The Great Beauty, directed by Paolo Sorrentino, which was in competition at Cannes among others movies. At the event will be present Anita Kravos, one of the actress in the movie. Within the festival’s program an outstanding portrait movie will be shown of Federico Fellini, titled: How odd my Name is Federico shoted by his colleague and friend, director Ettore Scola. Well-known directors, as Giorgio Diritto and Paolo Virzi latest productions will be screened as well, titled: One day you have to go, and the Every single day. Further pictures to be seen at the festival also will be the Itaker – director Toni Trupial, who will personally be present on the screening day at the Puskin Cinema. On with the list of pictures to be on-screen will be: I travel alone – director Maria Sole Tognazzi. Good morning, Father! – director Edoardo Leo will be the guest at the projection. Pinocchio – director Enzo D’Alò. Bellas Mariposas – director Salvatore Mereu. Rope Dancers – director Ivano De Matteo. Long live freedom! – director Roberto Andò. In addition with the upcoming pictures, this year will also be screening short films from the selection of the Riff 2013 (Rome Independent Film Festival) and Kalat Nissa Film Festival 2013. The Italian films will be in Hungarian simultaneous interpretation or subtitled in Hungarian language. The detailed program can be found at the Italian Cultural Institute and the Puskin Cinema. So … Italians working, living in Budapest … Go For It – Make Your Day, watch the movies in your mother tongue language. Also an “A” for practising the Italian language not just for the Hungarians, but at all stage for those in communicating in Italian language. 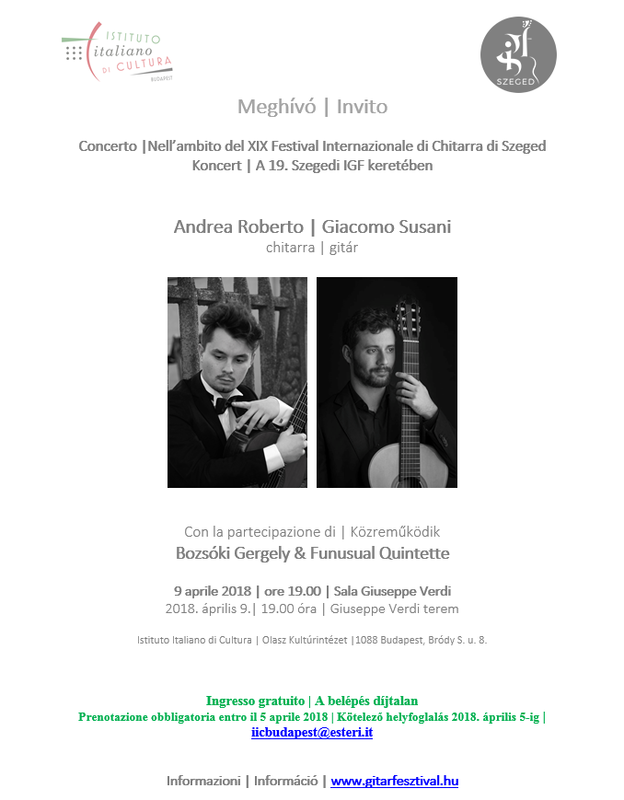 Tickets can be purchased at the Italian Cultural Institute – District VIII., 8. Bródy Str. Budapest and/or on the spot at the Puskin Cinema – District, V., 18. Kossuth Lajos Str. Budapest. More information after the press hearing.